Apple Valley Villas are efficiencies located near Apple Valley Golf Course at Rumbling Bald Resort. The resort was built on the shores of Lake Lure and features two championship golf courses. This 280 acre property features: 70 lodge rooms, 7 private two bedroom guest houses, 9000 sq/ft of versatile meeting space, 27 holes of Golf, World class SPA and Salon, Golf & Tennis Academy, Aquatic and Fitness Center, Marina with great Bass Fishing on the Butler Chain of Lakes. Only 2 miles form the Convention Center / I-Drive & Universal Studios / Disney & Lake Buena Vista. This 280 acre property features : 70 lodge rooms, 7 private two bedroom guest houses, 9000 sq/ft of versatile meeting space, 27 holes of Golf, World class SPA and Salon, 3 restaurants & 3 bars, Golf & Tennis Academy, Aquatic and Fitness Center, Marina with great Bass Fishing on the Butler Chain of Lakes. Only 2 miles form the Convention Center / I-Drive & Universal Studios / Disney & Lake Buena Vista. One of North Myrtle Beach's leading oceanfront destinations, Avista Resort provides guest with both indoor and outdoor pools, hot tubs, and a lazy river. Offering an onsite restaurant and located just blocks away from Main Street, you will enjoy easy access to stores, restaurants, and more. A brand new hotel, the Best Western Plus Austin Airport Inn & Suites is conveniently located just one mile north of the Austin-Bergstrom International Airport and only three miles from Downtown Austin. The new hotel proudly offers complimentary hot breakfast buffet served in our spacious breakfast room as well as variety of other amenities including an outdoor swimming pool and state of the art exercise facility. Located right off I-10, Exit 34A, our Gulfport hotel is known for providing guests with the ideal location to easily get around the area. Whether you're here for business and need a quick commute, or simply want to be close to all of the attractions, we're your home away from home. Luxury bedding, quiet spacious rooms, and a superior location are what make us a favorite. Champions Gate Resort offers vacation homes with 4 to 9 bedroom houses. All homes have a private screened swimming pool and covered lanai. The resort features an 18 hole golf course, Champions Gate. A true resort, Champions Gate has amazing amenities including a clubhouse, huge pool with water slides, a lazy river, fitness center, tiki bar, movie theater, and volleyball courts. Champions Gate is near Walt Disney World, Universal Studios, and SeaWorld. Champions Gate is a great choice for group golf vacations. Centrally located off I-95 along the banks of the Rappanhannock River and near several Civil War battlefields, the Clarion Inn Fredericksburg provides well-appointed accommodations with options of double, king rooms with exceptional amenities including a free, hot breakfast. The Clarion Inn Fredericksburg is a pet-friendly hotel offering an indoor pool and hot tub, an outdoor seasonal pool, exercise room, business center and free Wi-Fi. Along with the area�s terrific golf courses the hotel is close to the James Monroe Monroe Museum and Memorial Library and the National Museum of the Marine Corp. When booking at our Clarion Inn� hotel in Gulfport, Mississippi, you can feel at home in relaxing guest rooms with a variety of amenities near the Mississippi Coast Coliseum & Convention Center. Enjoy Orlando with a stay at the Comfort InnR International! This family hotel in Orlando Florida is close to the Orange County Convention Center (OCCC), Florida Citrus Bowl Stadium and Disney Golf Courses. Enjoy the free hot breakfast featuring eggs, meat, yogurt, fresh fruit, cereal and more, including your choice of hot waffle flavors! Enjoy the convenience of the Comfort Suites� Airport hotel in Flowood, MS located off Highway 25 and Interstate 55. We�re just 10 minutes from Jackson-Medgar Wiley Evers International Airport. Located only a couple miles away from Busch Gardens, Courtyard features 139 rooms and 12 suites with complimentary parking. Guest are able to reserve 1 king or 2 queen beds for their accommodations. Hotel is centrally located to the Colonial Williamsburg and local golf courses. Courtyard offers complimentary high-speed internet. Convenient to local attractions such as Busch Gardens and the historic area of Colonial Williamsburg. Modern conveniences such as fitness rooms, business center, indoor-outdoor pools, and J.B.'s Tavern. Guest may reserve 2 double or 1 king rooms. A beautiful hotel with bright and modern rooms featuring one King or two Queen beds, the Running Rabbit Inn is the perfect lodging for your golf vacation. Located next to the Dancing Rabbit Golf Club and � mile from the Pearl River Resort the Dancing Rabbit Inn offers 140 hotel rooms with full services and amenities that include complimentary Wi-Fi, business center, indoor heated pool/whirlpool, fitness center and 24 hour shuttle service to/from the casinos. 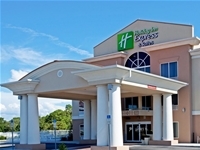 Days Inn Hotel in Orlando is a convenient location off Interstate 4 with easy access to Orlando area attractions. There friendly staff will allow you to have a worry-free and comfortable stay while visiting Days Inn Orlando. Enjoy the International House of Pancakes that is on site and open 24 hours, for your convenience. The Days Inn Virginia Beach Oceanfront hotel sits right beside the Atlantic Ocean. Enjoy walking out of the hotel right onto the beach and enjoy access to the area's best attractions and activities. Not only are in you in the middle of the resort strip, but all rooms feature oceanfront views. 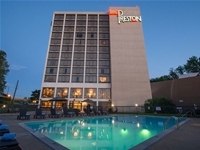 This 296 all-suite, full service hotel is conveniently located just minutes from the Nashville International Airport. We offer complimentary airport shuttle service as well as complimentary shuttle to and from Gaylord Springs Golf Links. Both the Hermitage Golf Club and Wintree are short drives away. Fairfield Inn & Suites Lexington Berea is conveniently located off I-75 south of Lexington and just minutes from Berea's artistic old towne. The Fairfield Inn & Suites offers a free hot continental breakfast, fitness room, and a heated indoor pool and is a great choice for your Kentucky Golf Vacation. Hotel can accommodate travelers in the most spacious guest rooms and suites in the area, less than 4 miles to Downtown Lexington. The hotel is 15 minutes from UK Club and Kearney as well as central to many of the other courses. Across from Tangler Outlet, Fairfield Inn & Suites is central to all activities in Pigeon Forge. Hotel offers complimentary breakfast, wireless internet and fitness center. Double Queens or King room available. Located near historic Colonial Williamsburg, Fairfield Inn & Suites is situated right in the heart of golf country. Fairfield is within 5 minutes of 5 golf courses and is adjacent to shops at merchant square. 2 double beds or 1 king bed are available for you to enjoy Williamsburg. Only a few miles from Tunica National Golf and Tennis, the Gold Strike Casino is a perfect choice for a fun time in the casinos along with some great golf courses! Hotel amenities include flat-screen TVs, marble bathrooms, and wireless internet access. Not only is there a pool, spa, and gym right at the tip of your fingers, there is a casino shopping mall only minutes away. Also, the oldest residence in Tunica, the Tate House, is a short 10 minutes from your hotel room. Peabody Place is a key attraction when looking to catch a movie or grab a bite to eat. All of these amenities and attractions are sure to make your stay at the Gold Strike Casino a golf trip to remember. Breakfast buffet is complimentary Sunday - Thursday. Grande Shores in Myrtle Beach offers 1, 2 and 3 bedroom condos and hotel rooms with covered parking, wireless internet, fitness room, lounge, lazy river, and pools that feature a poolside bar and grill while in season. This oceanfront property has plenty to offer for you next trip to Myrtle Beach. Located immediately off I-40 and within a few minutes drive of Hermitage, Windtree, and Gaylord Springs golf courses. Hotel is beautifully appointed with 111 rooms convenient to downtown Nashville. Located just off the Sevierville exit on I-40/75, Hampton is convenient to golf courses along the interstate and Pigeon Forge area. There is also a Bass Pro Shop, Chop House and Smokies Baseball only a few blocks from the hotel. 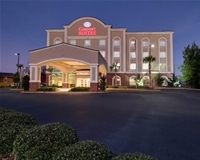 The Hampton Inn & Suites Gulfport offers bright and inviting rooms with free WiFi. Before hitting the links be sure to enjoy the complimentary hot breakfast buffet. The Hampton Inn is conveniently located near several golf courses. You will also be close to the coast with miles of white sand beaches. After a round of golf, try your luck at one of the numerous casinos on the coast. Hampton Inn Biltmore has 121 guest rooms convenient to all major attractions in Asheville. Hotel is also popular due to the convenience to local golf courses around the city. Only 4 minutes from downtown with 67 well-appointed rooms with your choice of Double Queens or King Bed. Just a short drive to many of the local golf courses. 154 beautifully appointed rooms with luxurious amenities such as hi-def TV. Only 2 blocks away from Bridgestone Arena and LP field. Harrah's Casion is a full service resort that embodies down home Southern Cuisine with several restaurants including '37 Steakhouse, the Field House Grill and Paula Deen's. The resort also features Bellissimo Spa, Cottonwoods Golf Course, The Funny Bone Comedy Club and Willows Sporting Clays and Hunting Center. During the summer months, guests should not miss out on the weekly Vegas-themed Heatwave Pool Parties at the Terrace Hotel. The pool effortlessly converts from the perfect oasis of relaxation to the hottest day club scene in the Mid-South every Saturday all summer long! The Hogan House at Little River offers relaxing view of the 9th green at Little River. It features 4 bedrooms with 3 king-size, 3 full-size and 2 twin-size beds and 4 1/2 private baths, spacious living/dining area and a fully equipped kitchen. It also offers an upper deck with a grill, seating for 8 and a screened in porch with fireplace. The lower deck has a firepit with views of the 9th hole. Holiday Inn Biltmore West is modern hotel featuring a large atrium entrance where guest can access the indoor-outdoor pool, restaurant, and lounge area. Beautifully appointed guest rooms with modern decor and a great location. Brand new Holiday Inn located in Farragut, Tennessee features a modern design with southern hospitality. The Holiday Inn is within a few minutes drive to several courses, and is convenient to Turkey Creek shopping center and many local restaurants. The Holiday Inn Fredericksburg-Southpoint is conveniently located off I-95 and near all of the Fredericksburg attractions. Complimentary breakfast is included. After a round of golf enjoy a dip in the indoor pool. With most area golf courses less than 20 minutes away, the Holiday Inn Fredericksburg-Southpoint is a great choice for your golf vacation. Holiday Inn Express of Southern Pines, North Carolina is just a short drive from about 40 area golf courses, with some of the best Pinehurst area golf courses offered through Mygolfvacation.com. The hotel is in a great location and within walking distance of several restaurants. A great option for staying during your Village of Pinehurst golf packages! Stay with us at the new Holiday Inn Express and experience the same great service you’ve come to love when staying at the Oceanfront. Our upbeat décor and interior enhancements with remodeled guest rooms and public spaces will impress the whole family. We are now a 100% smoke-free hotel. The name may be Holiday Inn Express but your vacation will be at your own pace at the Virginia Beach Oceanfront. Call for Memorial, Labor Day, 4th of July pricing. 2 Nt minimum May through September. 150 hotel rooms especially designed to make your Virginia Beach visit fun, comfortable and convenient. Private balconies overlooking the boardwalk are perfect for golfers looking for a golf getaway. There is also a oceanfront cafe on location. Choose from 1 king or 2 queen beds. Call for Memorial, Labor Day, 4th of July pricing. 2 Nt minimum May through September. The Holiday Inn Orlando Disney Springs Area is an official Walt Disney World hotel. Located walking distance from Disney Springs. Complimentary shuttle to and from Disney parks departs every 30 minutes from hotel lobby. 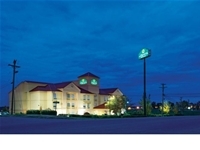 Holiday Inn Express is just off I-75 close to Lake Reba, Gibson Bay Golf Course, and Eastern Kentucky University. Hotel features a two-story breakfast area, upgraded hotel rooms, and indoor pool. Hotel also offers wireless internet and fitness center. Hotel Indigo Austin is hip, modern hotel in the heart of the downtown music scene. Amenities include a rooftop pool and lounge, restaurant, cocktail bar, and fitness center. Centrally located, the Hotel Indigo is near several top notch golf courses. Kiva Dunes Condos is unlike most places. Upon arrival you will only need a pair of flip flops or golf shoes if you are only golf at Kiva Dunes Golf Course. You can grab breakfast close by at the lodge's kitchen, walk to the health club, or just relax on your balcony, taking in the warm sea breeze and beautiful views! Book you Gulf Shores golf packages today! Hotel is close to River Islands and Ruggles Ferry Golf Club. Convenient to Pigeon Forge as well as downtown Knoxville. Rooms feature king size beds or double queen rooms with complimentary breakfast and high-speed internet. 5 Bedrooms, 3 Baths, Pool Table, Air Hockey, Electronic Dart Board, Foosball Table, Pool Table, Jukebox, Xbox game system, Hot Tub, Secluded, Internet Access, Big Screen TV in the Game Room. 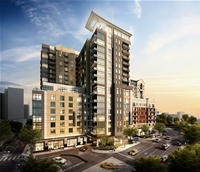 Minutes from downtown Nashville, Mainstay is close to Grand Old Opry and Cool Springs Mall. Also close to LP field, Vanderbilt and Nashville convention Center. Located just outside Austin in Round Rock, Texas. Marriott Austin North is conveniently located near Top Golf Austin and many local golf courses. Also find an array of restaurants, entertainment and activities near your hotel. Marriott features King or 2 double hotel rooms with flat screen TV, Wi-Fi and indoor pool. Mid South Lodges are 16 High End Luxury Condominiums located adjacent to the Mid South Clubhouse. Premier luxury resort with spacious rooms features a beautiful lobby, family waterpark, 24 hour indoor pool, gameroom, exercise room, and complimentary breakfast. Located in the center of attractions, shopping, dinner theatres, and restaurants. Nestled on over 600 acres of rolling hills and tropical landscaping, Mystic Dunes provides 1 to 3 bedroom villas with a golf course on-site. Condos are spacious with a wide array of resort amenities and services including the beautiful Mystic Dunes Golf Course. Resort has 4 pools(2 water slides), tennis courts, bicycle rentals, wifi, miniature golf course and 18 holes of championship golf. Conveniently located to Disney, Universal and SeaWorld. As one of the newest oceanfront resorts in Virginia Beach, Ocean Beach Club features stunning views of the ocean and spacious one and two bedroom suites with separate living rooms that include queen sleeper sofas. Unwind at any of the Ocean Beach Club's 4 oceanfront pools, two outdoor and two indoor. With 400 rooms in a variety of suites, villas and penthouses, the Ocean Dunes conveniently puts all the excitement of Myrtle Beach at your doorstep. Ocean Forest Plaza is located oceanfront in the exclusive Ocean Forest section of Myrtle Beach. Away from the crowds, but close to all the area attractions, Ocean Forest Plaza is the perfect destination for all ages. The resort features one-bedroom suites with your choice of two double beds or King bed. The combination of deluxe accommodations, outstanding location and excellent services and features makes Ocean Forest Plaza an excellent value for your vacation. This popular resort was named after the original Ocean Forest Hotel, which served as a famous South Carolina landmark for decades. Located on ten acres of tastefully landscaped grounds in the Pine Lakes area, the pristine setting makes these spacious condos as comfortable as they are charming. All units have a spacious two bedroom, two bath design, with a living room, dining area and a full-sized, fully-equipped kitchen. Oceanaire Resort Hotel offers oceanfront or ocean view deluxe rooms rooms or one and two bedroom high end suites with fully equipped kitchens and kitchenettes,and private balconies overlooking the Atlantic Ocean. This is the newest luxury resort at the Virginia Beach oceanfront and features 4 oceanfront pools, 2 indoor and 2 outdoor, jetted tubs, stainless steel appliances, granite countertops, an ocean view fitness center. The Omni Austin Hotel at Southpark is conveniently located near several champion golf courses and is only 4 miles to the heart of downtown Austin. This Four Diamond hotel's amenities include indoor/outdoor heated pool, 24-hour fitness center, the Trinity Spa, Onion Creek Grill, Lobby Lounge, and a coffee shop. For magnificent luxury in the heart of the Texas state capital, Omni Austin Hotel Downtown offers an unparalleled experience for travelers. Enjoy spectacular views, well-appointed accommodations and easy access to the Austin business and entertainment district. Whether you�re looking for high culture, live music or an unforgettable event, Omni Austin Hotel Downtown can make it happen for you. And the hotel is just 7 miles from Austin-Bergstrom International Airport. Palmetto Dunes Ocean Front Villas. Not available from June 9 to August 10, 2018. 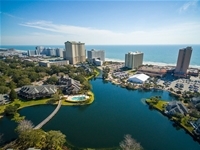 Palmetto Dunes Resort View Villas. Not available from June 9 to August 10, 2018. Overlooking the Atlantic Ocean this is one a great Myrtle Beach Resort offering 1, 2 and 3 bedroom condos, where the historic Cherry Grove Pier meets the Myrtle Beach shoreline. The resort is loaded with luxury amenities and a rooftop pool. The Ramada Asheville at River Ridge is located off I 40 and I 240 and only minutes from Downtown Asheville. Enjoy breathtaking views of the Blue Ridge Mountains from the observation deck at the Ramada Asheville. With great value and convenience, the Ramada Asheville at River Ridge is a great pick for your Asheville golf vacation. Reunion Resort offers the comfort of beautifully appointed one, two, or three-bedroom villas; three to six-bedroom private vacation rental homes; or luxurious suites in the Reunion Grande. Most villas border one of the three on-site championship courses and include living/dining room with private balcony or patio, fully equipped kitchen, secluded master suite and additional bedrooms providing queen, two double or two single beds. The private residences are individually furnished and decorated to extremely high standards. They offer golf course and/or lush garden views with option of a private pool. The one and two bedroom Estate Villas located at the 11 story Reunion Grande are the crown jewel of the resort. They feature a flat-screen TV and DVD/CD in living room, master bedroom with a king bed and second bedroom with 2 doubles, fully equipped kitchen with granite countertops and stainless steel appliances, spacious dining and living room area with queen sleeper sofa, spacious private balcony with table and four chairs, washer/dryer in villa and upgraded d�cor and technology package. Located in the heart of Pigeon Forge, this resort features a variety of floor plans with stone fireplaces. A full package of resort amenities from spa treatment to fishing is available. Stay in luxury at the 1 bedroom king or double queen Sanctuary Hotel rooms. 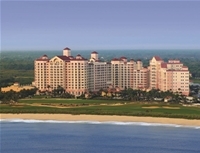 World-class golf and tennis facilities, spa, and immaculate beach will provide a soothing golf vacation. Hotel rooms include 40 sq. ft balcony, walk-in showers, high-speed internet, and Omaha bedding. In the hub of Myrtle Beach's exciting 74th Avenue North, Sand Dunes Resort and Spa is a playground for families, golfers and all those looking for non-stop fun and entertainment. Blessed with an outstanding setting that stands far above other resorts, Sands Beach Club has come to be recognized as one of the Grand Strand's ideal getaways. Sands Beach Club lets you enjoy all the privacy and seclusion of your own white sandy beach, located oceanfront in the Arcadian Shores section of Myrtle Beach. This all-suite resort is complete with spectacular ocean views from every room and is an ideal retreat for families who enjoy a tranquil vacation at the beach. 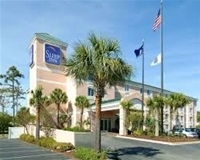 The Seaside is located in North Myrtle Beach just a short drive to all that Myrtle Beach has to offer. The property offers high speed internet, cover parking, fitness room, continental breakfast, pools, and hot tubs. 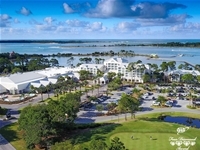 The Sheraton Bay Point Resort, a AAA Four Diamond resort, features 36 holes of championship golf. Play the only Nicklaus course on the Panhandle! The second course is the Meadows Golf Course featuring a classic Florida layout with tall trees, tight fairways, and water hazards. The Sheraton Bay Resort has many amenities and is a great choice for your golf vacation. The Sheraton Bay Point Resort is currently closed due to Hurricane Michael. Located in the western part of Ashville, Sleep Inn West has recently renovated guest rooms with either 2 double beds or 1 king bed and offers a hot complimentary breakfast buffet. Features a business and a fitness center. Mountain view rooms are available. Solterra Resort features large homes with 4 to 7 bedrooms, perfect for golf travel groups. The resort's many amenities include clubhouse, resort style pool, lazy river, fitness center, and Cafe/Bar. Solterra Resort is located near top-rated golf courses and Orlando attractions Disney World, Universal Studios, and SeaWorld. SpringHill Suites Louisville Downtown offers good lodging downtown for your Louisville golf packages. SpringHill Suites Norfolk is located near Virginia Beach's Town Center, Norfolk International Airport, and downtown Norfolk, and is ideal for a great central location for Virginia Beach golf packages. The hotel provides complimentary shuttle to and from Norfolk Airport. Offering great amenities such as complimentary breakfast buffet, kitchenette in each room, and more than 3,000 square feet of meeting space. One of the newest hotels in the Pinehurst/Southern Pines area with 33% larger rooms enabling guest to stretch out comfortably in a room featuring separate areas for eating, working and sleeping. Hotel is centrally located to all golf, shopping, and restaurants. Storey Lake offers condos, townhomes, and pool homes near popular Orlando attractions Disney World, Universal Studios, SeaWorld, and, of course, championship golf. This resort features a pool, lazy river, tiki-bar, volleyball courts, fitness center, and kayak rentals. 4 bedroom cottage located on the 9th green of Little River Golf Course featuring 3 private baths, spacious living area and fully equipped kitchen. Cottage has 1 king bed, 3 full, and 5 twin size beds. This luxury Four-Diamond Award inn is located at one of the top golf resorts in North America. It is also convenient to shopping, tennis, and dining. The Inn at Harbour Town is a great option for all Hilton Head golf packages. Two night stay minimum. BLACK OUT RESTRICTIONS MAY APPLY TO ALL MAJOR HOLIDAYS, PLEASE CALL FOR MORE DETAILS. Originally built in 1926, The Waynesville Inn offers 111 double occupancy guest rooms positioned along each of the Inn's three nine hole layouts. Many rooms provide golf course and mountain views, and the Inn offers amenities like complimentary hot breakfast, two restaurants and spa services on-site. The Towers at North Myrtle Beach offers artfully detailed rooms, great views, and very relaxing amenities. This property has 1, 2, and 3 bedroom units with oceanfront and ocean view rooms to provide you with a great coastal experience and enjoyable stay. Villas of Grand Cypress is Orlando�s premier AAA Four-Diamond resort offering luxurious suites and villas along with championship golf, and dining. Endless recreation includes fitness center, pools, tennis, biking, jogging/walking trails, rock climbing wall and much more. The resort is located just minutes from all major theme park and shopping. Wilderness at the Smokies provides multiple lodging options just steps from The Sevierville Golf Club. Lodging, dining, refreshing drinks and other on-site amenities are at your finger tips when you stay with the Wilderness. Stone Hill Lodge has double queen beds or king bed overlooking the resort with tons of amenities including a waterpark, restaurant, bar, laundry services, arcade, and shuttle between lodges. Wilderness at the Smokies River Lodge is located just across from the Sevierville Golf Club and in the same building with the waterpark. Lodging, dining, refreshing drinks and other on-site amenities are at your finger tips when you stay with the Wilderness. River Lodge has tons of amenities including a waterpark, restaurant and bar. The lodge rooms have modern mountain decor with your choice of one or two bedroom suites. Shuttle service is available to waterpark and River Lodge. Townhomes with 1, 2 or 4 bedrooms located at Fairfield Glade Golf Resort. Great location with access to 5 golf courses at the private resort.2 Night Minimum stay. Windsor Westside Resort features large homes with 5 to 8 bedrooms, perfect for golf travel groups. The resort's many amenities include clubhouse, resort style pool, lazy river, water slide, tiki bar, fitness center, volleyball courts, and video arcade. 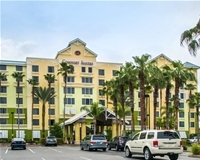 Windsor Westside Resort is located near Orlando attractions Disney World, Universal Studios, and SeaWorld. Windsor Hills Resort features 3 bedroom condos and townhomes and spacious 4, 5, and 6 bedroom pool homes, perfect for golf travel groups. The resort's many amenities include clubhouse, resort style pool, water slide, fitness center, volleyball courts, basketball courts, tennis courts, and video arcade. Windsor Hills Resort is located near Orlando attractions Disney World, Universal Studios, and SeaWorld.